“Pouring Out The Heart” from Christian Faith Publishing author Evangelist Riley reveals the importance of relying on God. Only by embracing the blessings of God’s world and surrendering to His Will is change for the better possible. “Pouring Out The Heart”: a reminder to rely on God and embrace the blessings of the world. “Pouring Out The Heart” is the creation of published author, Evangelist Riley. Published by Christian Faith Publishing, Evangelist Riley’s new book shows readers how to surrender their lives to God. “Pouring Out The Heart” is about the blessings found in this beautiful world that God created. People are so busy with things only God can fix that they become lost. Because they do not realize change is impossible without faith, they waste their lives away. At the end of the day, they have more problems than blessings. People need to know only God can see within them and know change is needed. God knows just how much pressure each of His Children can endure. God knows how to fix their failures and overcome their shortcomings. God is the key to success. People must learn to put God first in everything they do. 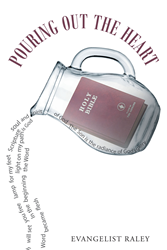 Pouring Out The Heart” shows readers how to do just that. View a synopsis of “Pouring Out The Heart” on YouTube. Consumers can purchase “Pouring Out The Heart” at traditional brick & mortar bookstores, or online at Amazon.com, Apple iTunes store, Kobo or Barnes and Noble. For additional information or inquiries about “Pouring Out The Heart”, contact the Christian Faith Publishing media department at 866-554-0919.